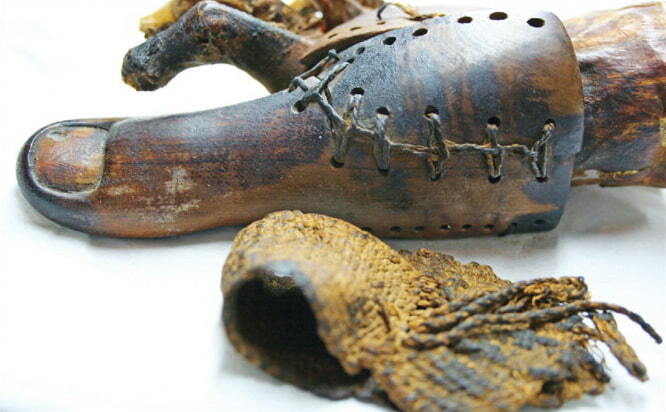 The field of prosthetics has a long and rich history, dating back to Ancient Egypt. The oldest practical prosthesis known to man is a toe made of wood and leather, which archaeologists found attached to the 3000-year old remains of an Egyptian noblewoman (950-710 B.C.). Besides this historical account, the Roman times have known some famous users of prosthetics. One of them was Marcus Sergius, a Roman general who had lost his hand during the Second Punic War (218-201 B.C.). He famously replaced it with a handmade of iron, which allowed him to hold his shield during battle. Nowadays, prosthetic sockets are made of innovative plastic and silicone materials, but this has not always been the case. The first transfemoral sockets were made out of wood and leather and had a conical shape on the inside. The basic conical socket later advanced into a quadrilateral socket, which could comfortably bear the ischial-gluteal weight of the stump. These came with an air valve and an air space at the bottom. Many patients had good results with these sockets, but many also suffered from oedema and skin problems. Later on, prosthetists introduced wooden sockets that had full contact with the stump. This new shape decreased the problems with oedema and helped to keep the prosthetic in place. In the old times, patients with a transfemoral amputation needed to use over-the-shoulder suspenders, which were later substituted by a pelvic band. Those with a transtibial prosthesis could use thigh lacers and waistbands to keep the prosthetic in the right place. Wood and leather were the materials of preference for a long time, and while they enabled prosthetists to make good prosthetic sockets, they were not ideal. Wood is difficult and time-consuming to shape, and leather is not that easy to keep clean. Therefore, prosthetists started experimenting with plastics and resins. These made the prosthetic fabrication process more efficient and allowed prosthetists to check the fit of the socket. Check sockets as we know them today, have not come into use since the 1950s. Before that time, they were not yet considered as a useful step in creating the perfect prosthesis. One of the reasons for their relatively late application was the controversy that surrounded check sockets. At the time, prosthetists looked down upon the notion of a check socket, because they believed it to be a redundant step in the creation of a prosthetic. If the perfect techniques were used from the beginning, the prosthetic socket would fit perfectly and not need any adjustments, or so many prosthetists thought. 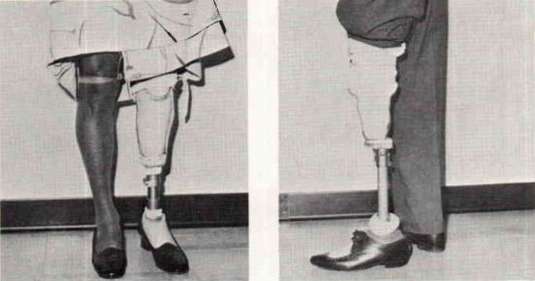 In the 1950s and 1960s, this attitude changed and prosthetists did start to see the value of using test sockets, as new transparent socket materials were introduced. The clear sockets allowed prosthetists to immediately see the areas that needed adjustment in the definitive socket, such as areas of redness. The first clear check sockets were made of Plexiglas, but because this material was so tedious and time-consuming to shape, researchers started to look for alternatives. They tried making sockets from acrylic and polyester resins, but these were equally difficult to work with and quite pricey. They were soon replaced with plastic laminates and thermoplastics, which were cheaper and easier to form. A highlight in the search for a more practical check socket fabrication was when Mooney and Snelson (1972) introduced a new socket fabrication method. The researchers showed how check sockets could be created by vacuum-forming a polycarbonate sheet material over a positive mould of the patient’s stump. It was a ground-breaking method at the time and made it very easy to fabricate clear check sockets on a professional basis. The method is still being used today and can be done with several other types of thermoplastics. Nowadays, transparent check sockets are widely accepted and used and are a valuable step in the creation of a definitive socket that is as comfortable as it is practical. Orfit’s thermoplastic check socket material, Orfitrans Stiff, can be moulded by vacuum-forming (bubble-forming).